Bats, Bats and More Bats! The Halloween Type! 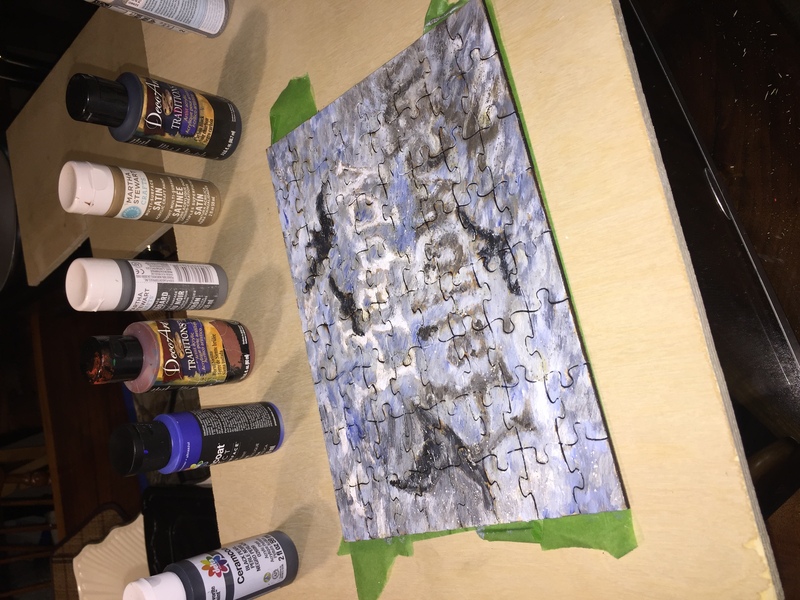 Inspired by David Picciuto’s Rockler-sponsored video on making puzzles using a laser, we decided to download his puzzle template, fire up the Full Spectrum laser and make a puzzle. In the past couple of years, we have produced holiday-themed puzzles using the laser (2016 Ghoul, 2015 Christmas Tree, Thanksgiving 2016, Halloween 2015 ). So with Halloween approaching, it was time to put out another puzzle. I searched the internet and found a Halloween image with some bats, and sized it to fit in a 10 inch by 7 inch space. Then, using the laser in raster mode I burned a light image of the subject on a piece of 1/8 inch thick Baltic plywood. I then loaded up the puzzle template, sized it to fill the 7 inch by 10 inch space, and in vector mode with 100% power and 60% speed, cut out the puzzle. Oh, before laser cutting, I covered the raster image with painters’ tape to reduce burn residue from collecting directly on the wood surface. I peeled the tape off after the puzzle was cut. So why did I pick bats this year? I like bats. They are high tech, insect-eating machines. If you get up close and personal, they are really kind of cute. We have several bat houses on our UF campus and it is really fun to watch them come out at dusk to do their thing…. eat insects! Back to the puzzle: after removing all the tape and cleaning up the parts, I turned the puzzle pieces over to my wife for PLPPP (POST LASER PUZZLE PIECE PROCESSING). I thought the image I laser-printed on the puzzle would make it easy to put the puzzle back together before painting…NO! It took my wife a couple of hours [days, actually…J] to reconstruct the puzzle. The image was too light and the puzzle pieces are so uniform that it made it really difficult to put the puzzle together. Once it was together, I sandwiched it between two boards and flipped it over. I covered the back side with painters’ tape to hold it together while my wife painted it, using acrylic paints and glitter. I followed this up with a couple clear coats of acrylic spray. My wife decided to extend the challenge she had undergone, and painted the puzzle in a fashion to keep the difficulty at a high level. Nobody is going to quickly solve this puzzle like a bat out of you know where! !